For all the foodies, Google now lets you broadcast your restaurant reviews and ratings you make on Google Maps on Twitter. The new feature added on Google Maps in October let users not only read reviews on restaurants from around the web but also reviews from other users, in addition, users can also ping their friends and share their thoughts on the nearby places instead of calling. To add even more sharing options, Google decided to allow the foodies to share that reviews directly on Twitter whereas before, users can only share their recommendations across Google’s products from Google Places, search results, and google.com/hotpot. When users plan to rate a restaurant, they can simply go to the rating widget and choose ‘Post review to Twitter,’ connect to the Twitter account, preview the message, and voila, your ratings will be on Twitter. What I like about the rating widget is the fact that user has options to play with the smiley face being the food is good and sad smile being the food is bad; it’s simple yet straight to the point. 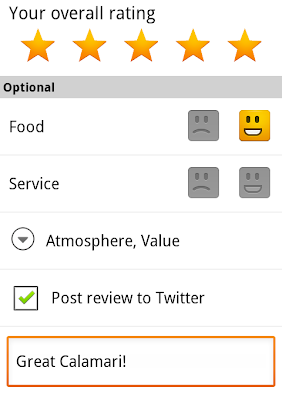 Users can then add whatever other comments they have on the food, atmosphere, or value in a little box provided. Besides the Twitter option, Google added feature to let users check into places with Google Latitude last month, to add a bit of convenience, Google now let users ping their friends with the exact address. Your friends will receive a map and exact location of where you are, you can then decide on where to meet using a simple request and notification format. Are you a Google Places or Hotpot user? What’s your experience on this application? Do you think the ping thing is useful?